Social edutech enterprise Siyavula Education has built a platform to help students to improve their math and science skills. Their interactive cognitive practice tool adjusts the difficulty levels of exercises through machine learning to cater to each student’s individual needs. At a time the Trends in International Mathematics and Science Study placed South African Grade 8 and 9 pupils at the bottom of international rankings, Siyavula are tackling one of the country’s biggest education challenges. The team has an ambitious mission: to make high-quality education universally accessible, even in South Africa’s rural areas. But far from today’s adaptable online tools, Siyavula-founder Mark Horner started off with simple textbooks. Together with a group of volunteers, he decided in 2002 to assist the struggling education sector by producing open-source textbooks and put them online for anyone to freely access and adapt. Supported by the Shuttleworth Foundation and the PSG Group, Mark realised that they wouldn’t see the desired impact if they didn’t also change the learning experience. This became the spark for Siyavula. “For the system as a whole to make a shift, it unfortunately takes more than just the textbooks”, he says. “To be honest, one of the hardest things to do is to get kids to practice regularly.” Building on a plethora of research in education, the Siyavula team then developed the concept of “Intelligent Practice” and an interactive, cognitive learning platform to carry it out. Fed with the latest curriculum, the cognitive learning engine identifies the relevant needs of grade 8 to 12 students and gives them unlimited math and science exercises. The cognitive learning engine generates an unlimited amount of math and science exercises individually tailored to each student’s skill level. This is why the engine is designed to let every learner master at least 70 percent of their exercises. Taking every individual student’s progress into consideration is something a teacher just can’t do for each of the at least 30 children in their class, but for technology, it’s all a question of code. Now, how do you get this principle to the learners who need it most? The platform can be accessed via computer, tablet or feature phone and the students then do the actual work on paper before they type in their answers. “Not every person has a device but you want to push the technological barrier as low as possible and most kids at least have access to a feature phone”, Mark explains. “So basically, if you have a Nokia 3330, you can get your science tasks online.” This way, there’s no waiting for everyone to have a tablet or large-scale laptop roll-outs all over South Africa. Interestingly, South African users spread quite evenly over the range of technology available: 30% use desktops, 36% tablets and 34% practice on their mobile phones. 75 high-end government and private schools have signed up to the platform; both to help their learners and to support their teachers in monitoring the students’ progress. Siyavula are also in the process of adding an additional 420 sponsored schools to the platform that are supposed to bring in another 100 000 students. 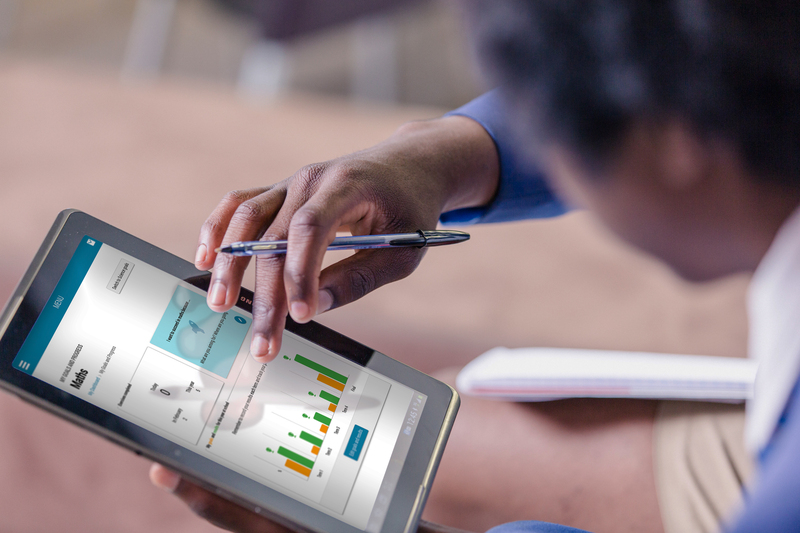 In March, an average of around 12.000 learners used Siyavula’s practice tool. “We are still well short of where we want to be”, he admits. 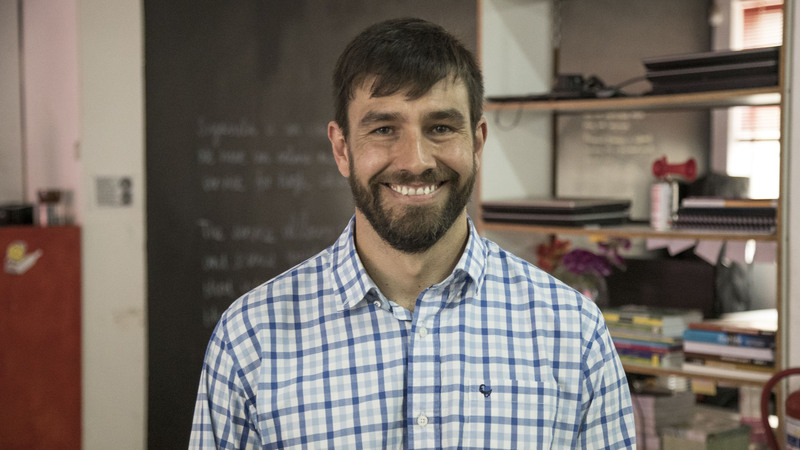 “So to really push the needle, we need to get close to a million learners.” With around 4,2 million high school students in South Africa, Mark wants Siyavula to get about 20 to 25 percent of the entire school body onto his system to make an actual impact – a goal the team is pushing hard this year. “So most of our revenue is still from sponsorship of the poorer schools”, Mark says. “That’s where we’re looking at this model of earned access and building up a pool of underwritten sponsorships”, Mark explains. In order to get the next month for free, students have to do 100 exercises each month – a counter helps them to keep track and stay motivated. Apart from sponsorship and the income from the top-end-school-market, Siyavula is generating revenue through sales to individuals. That’s why increasing the user numbers is not only a question of impact but also of Siyavula’s financial success. Whilst the textbooks are still available online and actively being amended by the community, they do not have a part in the business model. Instead, the learning platform is monetized on the back of open educational resources.